Pittsburgh Penguins GM Jim Rutherford had a plan following a very disappointing 2014-15 season, which was also his first with the franchise. He repeated two words multiple times throughout last summer after observing what the Chicago Blackhawks and Tampa Bay Lightning were able to do in the postseason one year ago. Rutherford wanted to build team speed. He also wanted to create an atmosphere that allowed the youth in the organization to play, as long as they earned it. While it obviously wasn’t smooth sailing from the start of the season, the Penguins stayed the course, eventually unloading Rob Scuderi and David Perron to add Trevor Daley and Carl Hagelin. Rutherford knew the Penguins were struggling but also understood that an NHL season is a marathon, not a sprint. One of those two, combined with two offseason acquisitions of Rutherford’s, now completes what is arguably the best second line in hockey, otherwise known as the HBK line. A far stretch from where any of them were just a few months ago. Hagelin, Nick Bonino and the enigmatic Phil Kessel were deployed together a few weeks ago after Evgeni Malkin suffered a long-term injury. Prior to that point, Kessel and Bonino were under constant scrutiny for their performance thus far in a Penguins uniform. Hagelin had disappointed in Anaheim and found himself with a new team trying to fit in. They made sure those conversations were put to rest. On Mar. 13, Pittsburgh faced the New York Rangers for their first game of this stretch without Malkin. Since that date, Bonino has tallied four goals and 15 total points in 13 games. Kessel has six goals and 13 total points in that stretch and Hagelin, after scoring just 12 total points in 43 games for the Ducks this season, has matched that production in his last 13 games with the Penguins. Pittsburgh has found themselves a truly special trio. Below, you’ll see their true production from Mar. 13 to present as a group, courtesy of Puckalytics.Com. As you can see, the three of them have spent just under 78-minutes on the ice together and they’re clicking at 4.63 goals-for per 60 minutes. They’re also accounting for over 60-percent of total shot attempts, indicating just how much time they spend in the opponents’ end. Those numbers aren’t score-adjusted, which makes them even more special. That means, even when leading in the third period as the Penguins do quite often, they’re still pressing hard and boasting impressive offensive numbers. To put that production in perspective, consider that one of the most dominant lines in the league this season, consisting of Patrick Kane, Artem Anisimov and Artemi Panarin, is clicking at 2.96 goals-for per 60 minutes of play. Obviously a much smaller sample size for Pittsburgh’s HBK line but impressive none-the-less. When you get this type of increase in production from a line that was formerly centered by Malkin, questions are raised. 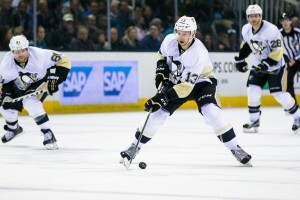 Are the Penguins better off without two superstars? Where does Malkin fit upon his return? Should they trade him? I tend to agree with Jesse Marshall of ThePensBlog.Com, with a small caveat. I don't think Bonino is what's making the HBK line run. I don't think Geno would disrupt what Hagelin and Kessel can do together. While I don’t think Malkin is a detriment to Hagelin and Kessel in any way, I wouldn’t necessarily break-up this trio upon his return if the Penguins make it far enough in the postseason for that to occur. I’m a firm believer in approaching hockey with the mindset of a top-nine in today’s NHL and as I’ve touched on previously, Malkin’s ability to carry a line means other options. There are two talented wingers producing impressive numbers in their small sample size together, and I see a fit with Malkin. Again, this information is courtesy of Puckalytics. Beau Bennett and Conor Sheary have played just under 22-minutes together and are accounting for nearly 58-percent of shot-attempts in that span. They’ve produced a goal in that short span as well. Sheary creates offense with his tenacity and speed, while Bennett is suited for the East-West style that Malkin enjoys. The following lineup presents a matchup nightmare for opponents. When healthy, I’d consider replacing Bennett with Bryan Rust but it all depends on performance and who’s in the lineup. Either way, keep the HBK line together and ride them until the wheels fall off. Right now, the Eastern Conference is a war of attrition. The mindset of top-six vs. top-nine needs to change and if the Penguins are lucky enough to be fully healthy, they’re better served simply adding another dangerous unit to the mix and leaving their current scoring lines alone. Every team in the league would love to have this problem. If it wasn’t for Rutherford sticking to his guns and waiting for the right deals to surface, none of this would be possible. Plus, knowing when to pull the trigger on a coaching change was crucial. There’s a lot less criticism of the veteran GM in the Steel City these days.